Rubber duckies could soon be at the forefront of an electronic revolution. In ACS Sustainable Chemistry & Engineering, scientists report they have used specialized nanogenerators that gather energy from mechanical vibrations to transform squeaky bathtub companions and other conventional children's toys into 'smart' electronics. They say the finding could have broad commercial applications, leading to the development of battery-free, self-powered toys, medical sensors and other devices. By age 4, virtually every child has had contact with an electronic toy or mobile device, according to the American Academy of Pediatrics. Keeping these devices blinking and beeping is tedious, often requiring frequent charging or battery changes. Researchers have explored alternative ways to produce and store energy for these devices without using batteries. One promising approach involves the use of triboelectric nanogenerators, or TENGs. TENGs gather electrical charges from friction, similar to the static that builds up on a balloon when it is rubbed against someone's head. TENGs amplify and convert this biomechanical energy into a usable form. However, ramping up these devices for commercial applications has been challenging, possibly because of low energy storage and conversion efficiencies. To address some of these issues, Sang-Jae Kim and colleagues at Jeju National University in South Korea sought to more effectively harness the energy from TENGs and use it to transform traditional toys into commercially viable, self-powered 'smart' toys. The researchers designed and incorporated TENGs—made with aluminum electrodes and an eco-friendly silicone-like film between them—into rubber ducks and clapping toys. Squeezing or shaking the toys alternatively separated and brought the electrodes into contact with film, creating an electrical charge. Once activated, the TENGs harvested enough biomechanical energy to illuminate several LED lights attached to each toy. The TENGs were durable, suggesting they could operate for substantial periods. The researchers conclude their unique approach can transform traditional toys into battery-free interactive ones, and raises the prospect of successfully using TENGs commercially in other "smart" gadgets including medical devices and wearable electronics. Next-generation toys are designed to entertain and interact with children. Such toys need a power source, generally a battery that must be replaced frequently, leading to increased maintenance costs. Recently, an innovative biomechanical energy harvester called a triboelectric nanogenerator (TENG) was introduced as an eco-friendly generator that scavenges waste energy. Here, in a step toward the commercialization of TENG devices, we present a novel approach that uses TENG technology to develop battery-free electronic smart toys. This robust, eco-friendly, and cost-effective approach for harnessing biomechanical energy can transform a traditional toy into a smart toy. 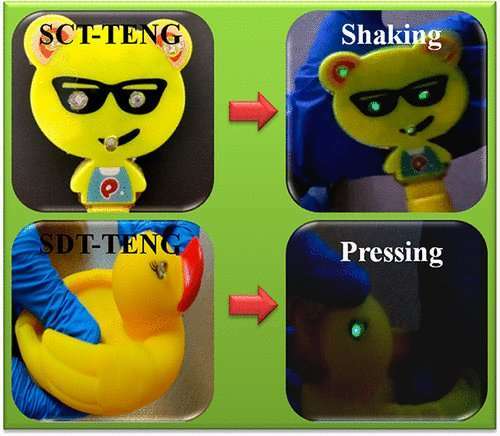 With this innovative idea, we developed a smart clapping toy (SCT-TENG) and a smart duck toy (SDT-TENG) using biocompatible materials. We employed a simple inbuilt circuit with light-emitting diodes that are powered using biomechanical energy. The SCT-TENG and SDT-TENG exhibited output voltages of 65 Vp-p and 260 Vp-p, respectively. We believe that the use of TENG technology for battery-free electronic smart toys opens up new possibilities for the commercialization of TENGs and the field of battery-free smart toys.